Creative outcomes are based on two opposing processes, and opposites just happens to be this month’s theme for The Sketchbook Challenge. 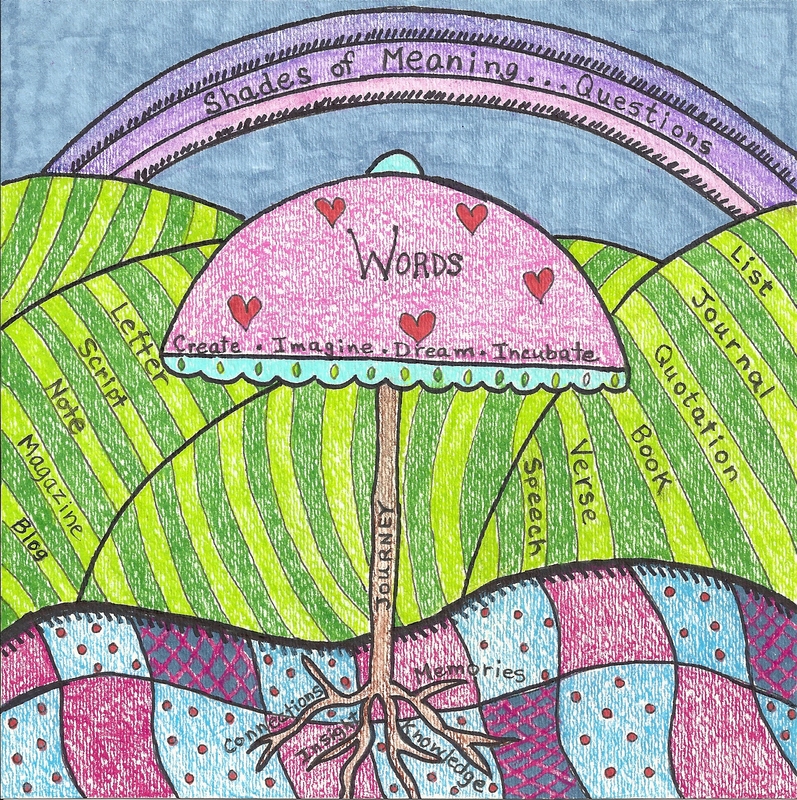 Before you write a poem or story, paint a picture, shape clay, weave beads into a new pattern, or pretty much anything else that involves your creative muscles, you begin to float ideas around in your head. This period of incubation, when you allow your subconscious to take over and dream, is much more effective if you set aside your internal editor and generate as many ideas as you can without passing judgment about the merit of them. Give yourself permission to think about what seems illogical on the surface, wild or zany, and then start building connections between one idea and the next, no matter how ill-suited they at first seem to be. This process of generating ideas leads to the next phase in creativity: synthesis based on a series of systematic choices. This is when you begin to compare your ideas to each other and to prioritize them, focusing on solutions, not obstacles, to your ultimate goal. 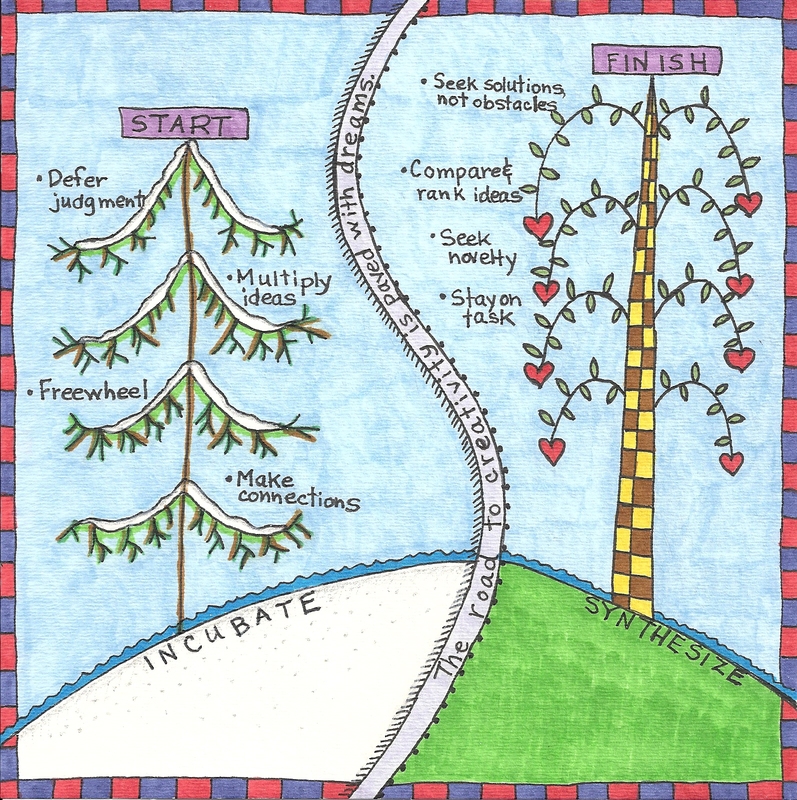 And one of those goals is to come up with something new and novel, so you’re not going to toss aside those seemingly odd ideas you generated during the process of incubation. Instead you will seek a deliberate way to incorporate your ideas. By staying focused, you will be able to narrow and combine the best of your ideas to create something unique. I’m not sure how much of this creative process is really conscious, to tell you the truth, but this is what occurs whenever we create. It is also a process that can be taught, which I have learned through the creative problem-solving program, Destination ImagiNation©, for which I volunteer. Generating creative options, and then focusing on the best ones, are opposite and necessary sides of the proverbial creative problem-solving coin. Below is my illustration of “Opposites,” which illustrates this concept. To see sketches from other participants of The Sketchbook Challenge, visit Flicker HERE. Consider joining this challenge yourself! Fear of failure is likely one of the most common reasons that people do not tackle the unknown. Though I usually enjoy taking on new challenges, I must admit this one makes me nervous. Drawing is not my forté. I have never taken a formal art class, and know next to nothing about drawing besides doodling. When I read about the Sketchbook Challenge in which fellow BBEST member Kimberly is participating (see Elusive Inspiration), however, I decided to stop making excuses and see what I can learn. Besides, it sounds like fun, and creative growth does not come without a little risk. The Sketchbook Challenge was started by fiber artist Sue Bleiweiss, with the idea that once a month, a theme will be selected for all participants. Everyone then designs as many pages as they wish that match the monthly theme, and shares them by posting photos of their art on their blogs and/or on Flickr, and by posting links in the comments section of the Sketchbook Challenge. To make this process a little less fearful for all, Sue invited 15 other artists to blog about their own progress in the Challenge. On January 1st, the first theme, “Highly prized,” was announced. Nearly every day of the month, a new blog post appeared with tales, tips and tutorials from Sue Bleiweiss and her co-hosts. The format of the Sketchbook Challenge is easygoing and feels friendly, so I have decided to participate and see where this goes. Participants are invited to explore different techniques, not necessarily drawing. Collage, for example, is one option. The idea is that visual art will express the monthly theme, instead of words. Below is my first entry—not perfect, by any means, but it reflects my best effort. 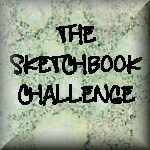 If you would like to participate in the Sketchbook Challenge, you can read the rules here.